On November 28, 1998, Rita Hester, a 34-year-old African-American transgender woman, was brutally murdered in her Boston apartment - a crime that to this day remains unsolved. Even in death, Rita’s victimization continued as news reports consistently misgendered her and used her name in quotes. Though Rita Hester was not the first transgender person to be a victim of transphobia and violence, her death became the catalyst for the launch of Transgender Day of Remembrance (TDOR) in San Francisco on the one-year anniversary of her death. Now in its 18th year, TDOR is a time for the transgender community and allies to mourn those who have been victims of anti-trans violence, and to recommit to ensuring that their lives - and deaths - are not forgotten. TDOR allows us to call attention to the continued violence and injustice transgender people face every day. In 2015, HRC reported the murders of at least 21 transgender people in the United States, more than any previous year on record. A disproportionate number of these victims were transgender women of color. That alarming trend has continued in 2016. HRC and the Trans People of Color Coalition (TPOCC) just released A Matter of Life and Death: Fatal Violence Against Transgender People in America 2016, a new, heartbreaking report documenting the often deadly violence faced by the transgender community and exploring the factors that fuel these tragic attacks. “TDOR is about mourning those who have been taken from us through violence, transphobia and hatred, and it is a way of recognizing the loss that those lives represent to our community,” said Nicole Cozier, HRC Director of Diversity & Inclusion. “TDOR empowers HRC’s steering committees, members and other activists on the ground to support members of the transgender community in their regions. It’s about mobilizing our communities to reach out and say, ‘We’re here and we stand with you.’” Cozier said. HRC steering committees and staff will be involved in more than 30 TDOR events around the country, working to stand beside their local transgender communities. 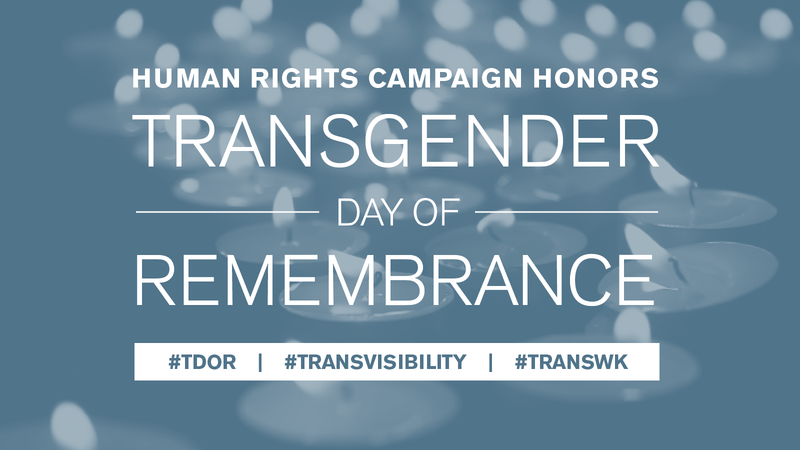 To learn more about HRC’s participation in Transgender Day of Remembrance, please visit http://hrc.org/campaigns/transgender-day-remembrance. For a list of vigils and remembrances worldwide, visit www.transgenderdor.org. This past week, HRC marked Transgender Awareness Week, dedicated to the progress, continued challenges, and unfinished work in the fight for transgender equality. Throughout the week, HRC dedicated each day to urgent and important issues facing the transgender community, including support for youth and families, workplace equality, access to life-saving and inclusive health care, and combatting violence against the transgender community. Learn more at hrc.im/TransAwarenessWeek.